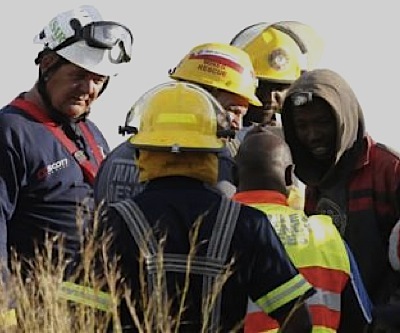 South African rescue workers have freed 12 of the more than 200 miners believed to be trapped underground since Saturday morning, while illegally mining gold in an abandoned shaft, Reuters reports. Emergency team members were able to make contact with a group of about 30 miners surrounded by fallen boulders below the surface. They claimed there were about 200 trapped, but officials have not confirmed the numbers. They have been taken into custody. After moving a large concrete slab that was obstructing the shaft belonging to Gold One, which has prospecting rights in the area,, just east of Johannesburg, but is not currently active there. According to Sky News, a rival group placed the large stone two days ago. Since a few of the remaining miners decided to stay underground, refusing to come out because they fear being arrested, the rescue team stopped its efforts by dusk. Police and mine security officials are staying there, however. The incident highlighted the growing concern about illegal mining in the mineral resources-rich country. Over 80 illegal miners died after an underground fire at a Harmony gold mine in 2009. And in March 2012, at least 20 workers were buried alive after a rockfall hit a closed gold mine in the eastern South African province of Gauteng.